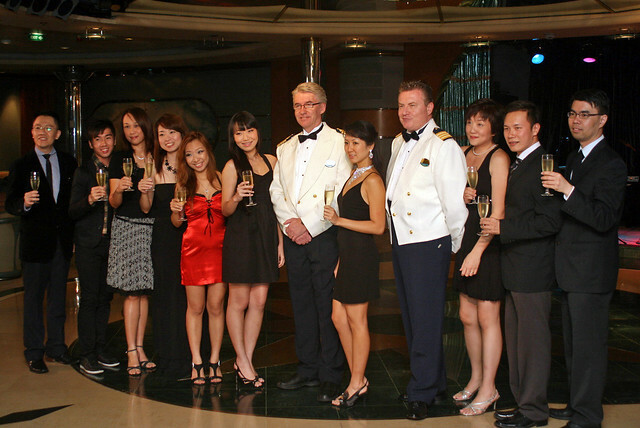 On each cruise, there is a formal night when guests get to dress up and enjoy a glamorous evening. 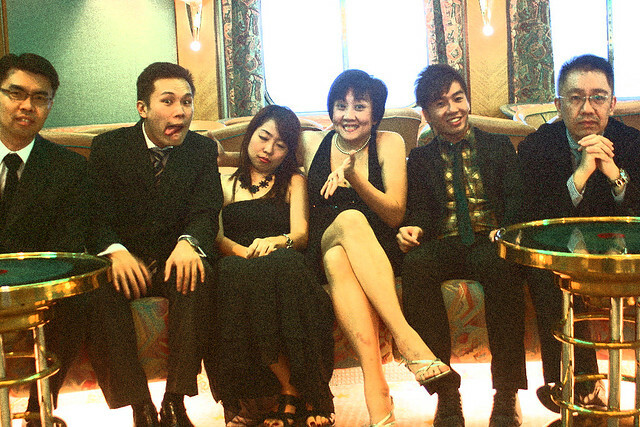 On the longer cruises (like 7 or 9 nights), there may be two formal nights. This harkens back to the grand old days of transatlantic voyages, when cruise guests were required to be formally attired each evening. So, girls, remember to pack some cocktail dresses, some bling and heels! Suit jacket, shirt and tie for the guys! You can rent a tuxedo if you like, on board. But just because it's formal doesn't mean you can't be goofy! And this is even before we had the champagne! Yes, we get to meet Captain Sverre Ryan and take photos with him at the Anchors Aweigh lounge. Come early for photo opportunities. That's him in the centre, and the other gentleman is Hotel Director Colin Clarke, I believe. Everyone was dressed so well. Even our OMY cameraman "Jack" looks dapper for a change! And of course with such a gala evening, the dinner at Romeo & Juliet seemed a bit more special too. After starters of Lobster Bisque and Escargot Bourguignonne, we had some nice main dishes. 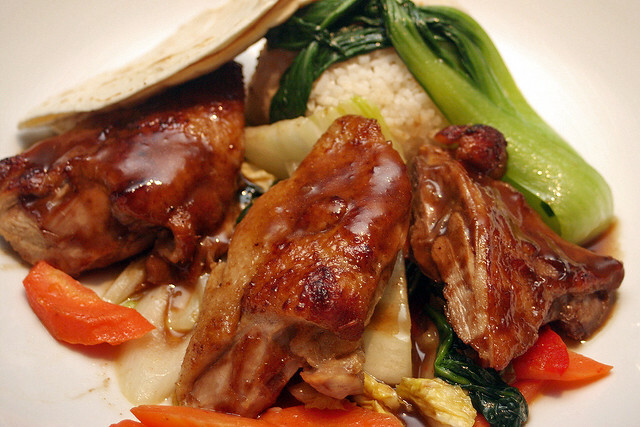 Here's Keropokman's Asian-style duck with Hoisin glaze, served with rice, vegetables and Chinese pancakes. Most of the time, the Asian mains can be hit-or-miss, but this turned out to be pretty good! 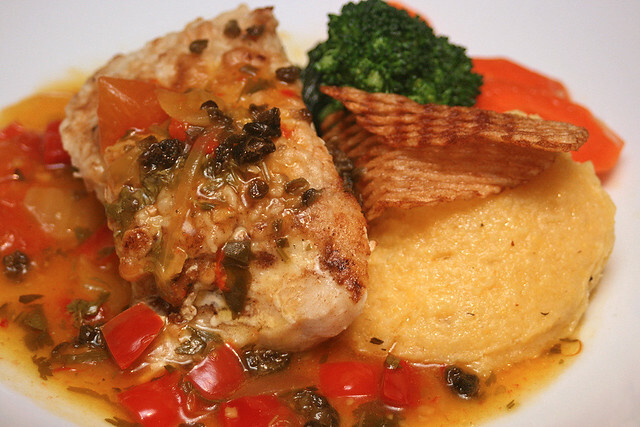 Cherie had the Golden Sea Bass: pan-seared and served on creamy black olive polenta. My Filet of Beef with piquant green peppercorn sauce, served with mound of creamy whipped potatoes and sauteed crimini mushrooms. I loved the fragrant, garlicky mushrooms! 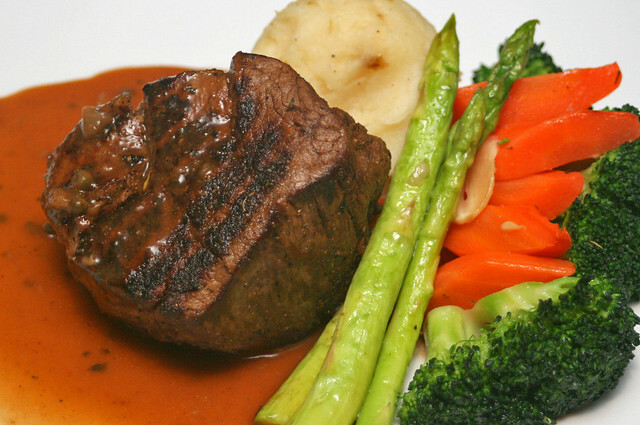 It's a good idea to ask for your beef one level more rare than what you usually order (e.g. medium rare if you usually go medium). They tend to cook it a little more (maybe to cater to certain Asians' preference). 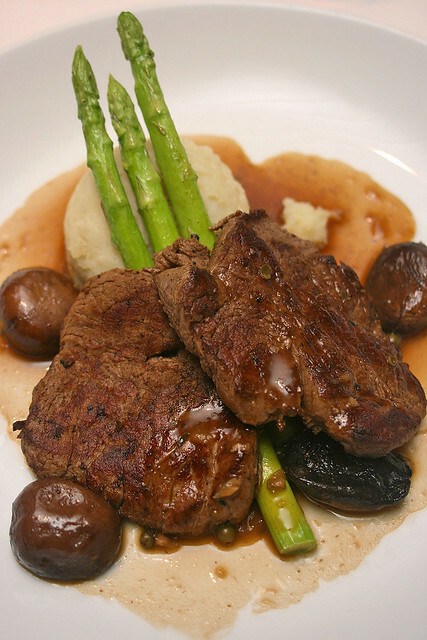 Or you could spring for the Chops Grille specialty Filet Mignon steak (available most nights at an additional cost of US$14.95). 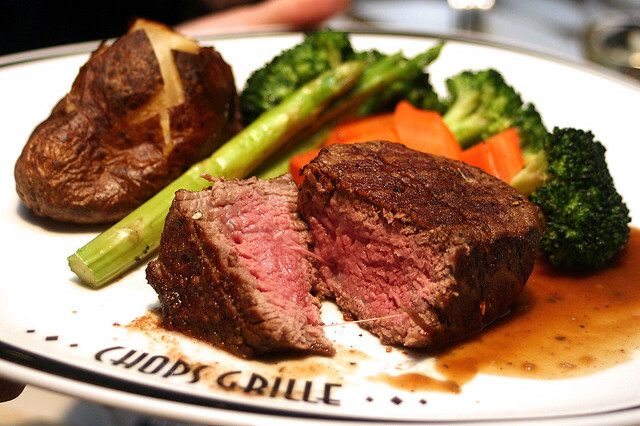 The Chops Grille Filet Mignon is a 10-ounce thick cut from the tenderloin. It really was much more tender and delicious. 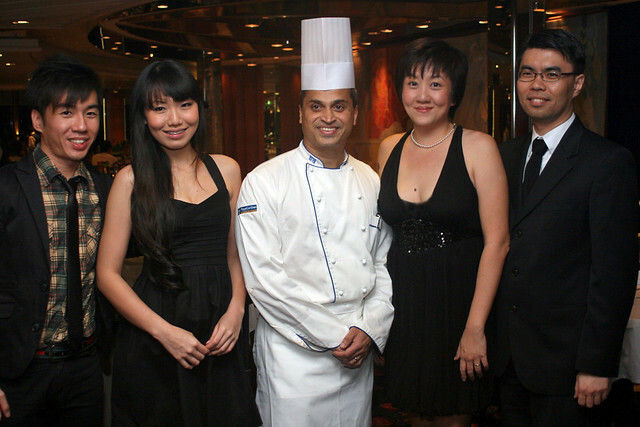 At the end of dinner, we got to meet the Executive Chef Suresh Balal who is behind all the exquisite culinary creations on board Legend of the Seas. Here's Calvin, Cherie, the chef, me and Keropokman/Philip (left to right). But wait, we're not done yet. The best is yet to be! DESSERTS! 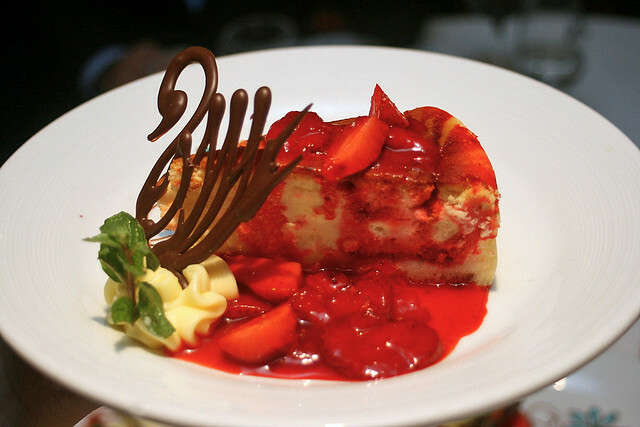 Double strawberry cheesecake - creamy cheesecake laced with strawberry swirl. Served with whipped cream, strawberry compote and a chocolate swan! This looked too good to be eaten! 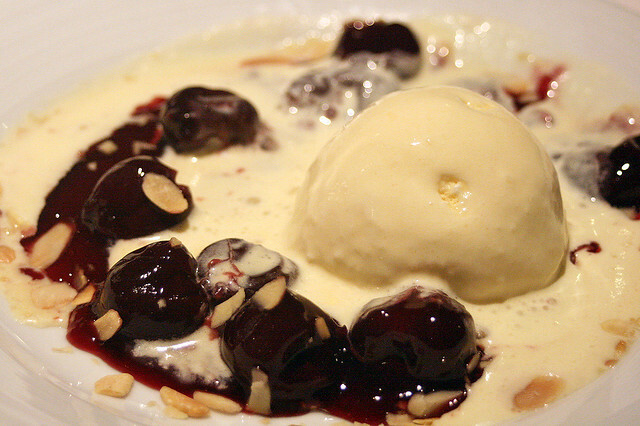 Cherries Jubilee (vegetarian) - warm, dark red cherries laced with Kirsch, ladled over vanilla ice cream. I think the ice cream melted at the very description! I know I did! 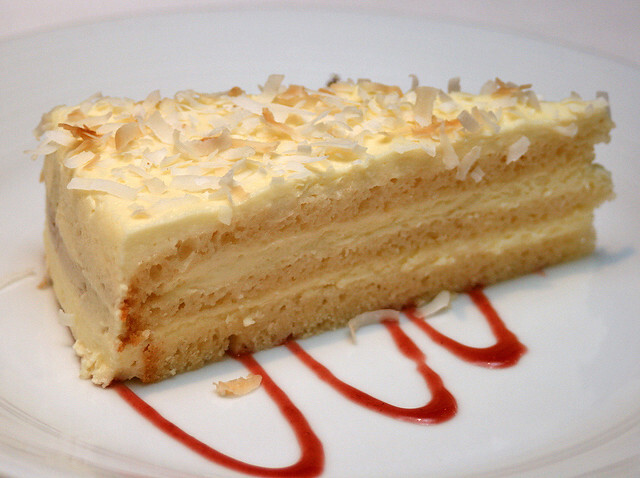 Sugar-free Coconut Vanilla Layer cake - the toasted coconut adds some crunch, and the Tahitian vanilla mousse beckons from between the layers of moist cake. Again, very thoughtful of them to prepare sugarless options. 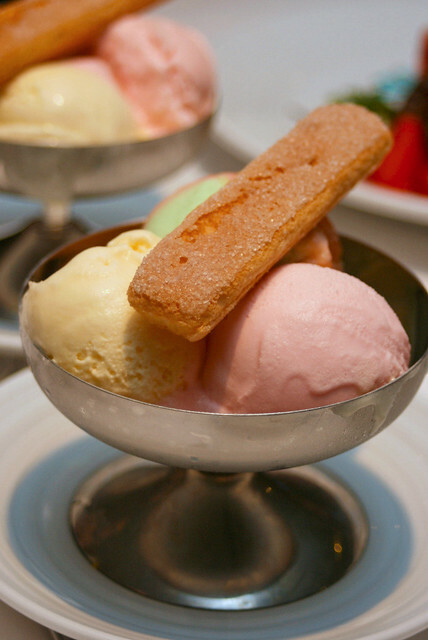 There is ice cream every night (sugar-free and sherbet selections available). As much as you want. 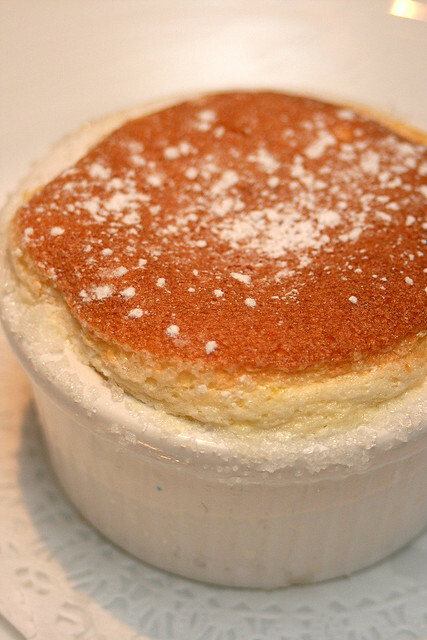 And one of the highlights - the Grand Marnier Souffle! 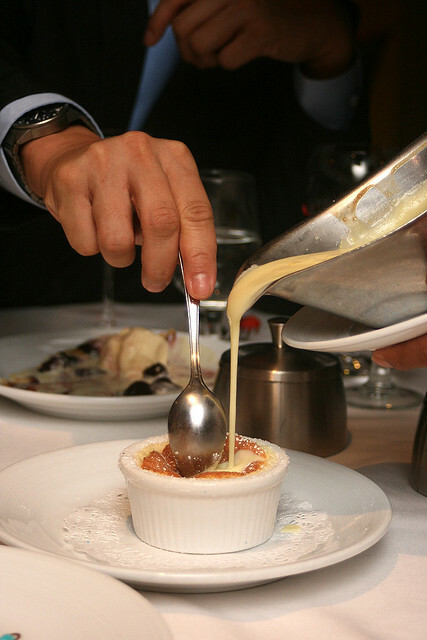 The server pours vanilla cream infused with the bittersweet orange liquer into the warm souffle. This is all done at your table, not in the kitchen. I can't imagine if everyone at the 1,000-seater Romeo & Juliet ordered this! But seeing how well-staffed they are, I'm sure they can handle it. Here's James from Royal Caribbean lending a hand with the spoon. He could be a hand model! After dinner, more musical entertainment in the theatre. 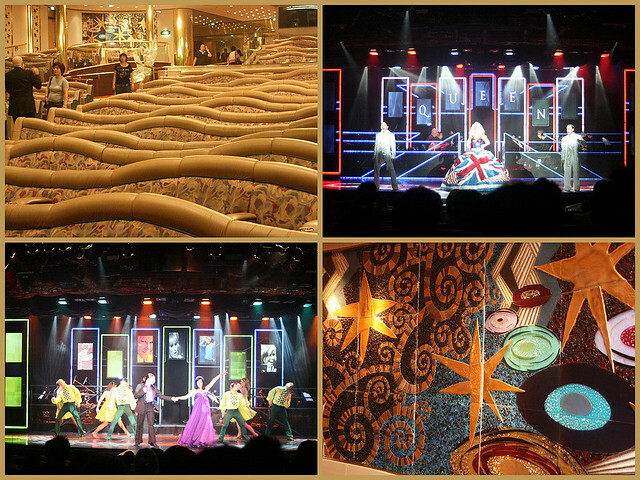 So many sets and costume changes for the musical montage - it's a high energy performance of new and classic hits! We even got a group photo with the talented Royal Caribbean dancers. What a swell job they have! Dancing and cruising, visiting places all around the world. Darren with the thumbs up clearly enjoyed their artistry! Meanwhile, remember to vote in the contest - you could win a set of Royal Caribbean luggage bags! You can vote once every day until Jan 18, 2011. Rita: hahaha, no way, you HK bloggers dress better on daily basis! Ju: yeah, this time have to! First time I see Philip so well-dressed too! Three-Cookies: yes, for one night only! But food quality pretty much consistent throughout. Desserts are some of the best things on this cruise! so this food only available if u attend the capital night? if eat else where can get the same food? Steven - yes, but essentially all the food comes from same kitchen, so you may get similar foods (just not the same presentation) at Windjammers Cafe.